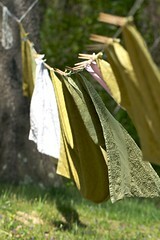 Does the summer weather make you want to save on your energy bill and take some of your clothes out to the line to dry? Line drying is reminiscent of a past time that many families no longer indulge. There are advantages to taking the time to line dry your clothes but there are also many disadvantages. One of the greatest advantages of line drying is the savings. By avoiding the dryer you are using less energy and decreasing your energy bills. Many people who grew accustomed to line drying from their youth mention the fresh scent. Many have tried to capture the scent in drier sheets, body sprays and perfumes. Line drying can save your clothes from the dryer, which can alter or damage some clothing. For many the few advantages to line drying do not outweigh the disadvantages to line drying. There are not a lot of hanging lines available today. As more people forget about line drying as an option, less homes are equipped with hanging lines. Overexposure to the sun can negatively affect your clothes. Other outside elements such as animals, bad weather and various other particles can also be exposed to your clothes causing unnecessary damage to your clothing. Line drying can take a great deal of time preparing and waiting for the clothes to dry. Enjoy the summer with family and friends and leave the laundry to Mark Pressed4Time. Contact us and save the decisions of line drying, dryer drying, or flat drying to the pros.